Let me introduce myself. My name is Enrique de la Vega. I am an artist and a practitoner in the art of the Sacred. In a word, I create contemporary Sacred Art for churches, shrines and sacred spaces. Like my forbears in the tradition of Christian art, I am constantly learning new ways of expressing the timeless, the universal and the Sacred. My admiration for early Christian art forms, Celtic illuminations and the spirit of the renaissance in artists like Giotto, Raphael and Michaelangelo, is boundless, as is my love of God's natural creation that surrounds us. It has been said that we live in the worst and in the best of times, and it is a fact that ugliness and evil abound; tho beauty and sanctity will always prevail. It is hope and faith that is the driving force in my work, in the universe of the aesthetic, and I attempt in some form to express the inexpressible and to inspire the soul to loftier heights in a world that hungers for beauty in the Divine. With pride I claim many artists, poets and writers in my ancient lineage, such as the renowned Spanish renaissance poet, Garcilaso de la Vega and his cousin the Inca historian by the same name. 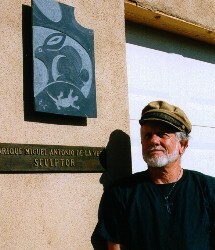 I received a Master of Fine Arts Degree from the Los Angeles County Otis Art Institute. 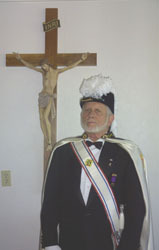 Artist, Sir Knight (Knights of Columbus of the Fourth Degree)Past Faithful Navigator for The Bishop Green Assembly, Prescott and Padre Kino Assembly in Green Valley Arizona and Past Grand Knight for council#805 in Las Vegas, New Mexico. 866 E. Florida Saddle Dr.